The dynamic nature of content, computing and global flow of information is now placing unprecedented pressure on content providers and data center owners to plan, deliver and operate a Terabit-scale ready cloud infrastructure. But key questions must be addressed in terms of what, when, where why and how they should be implemented. 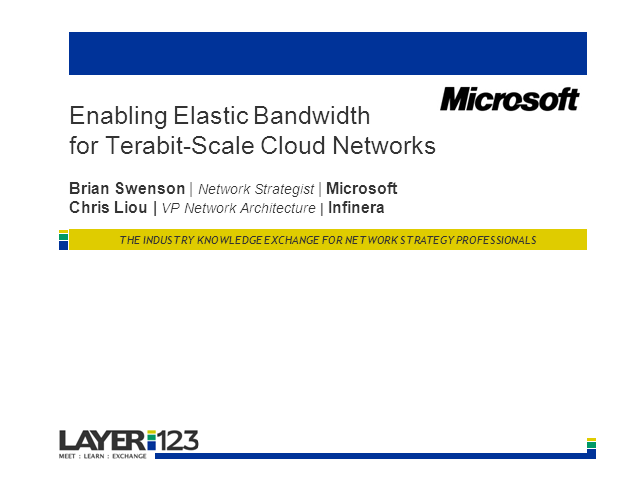 This presentation/case study evaluates a real-world content provider's requirements and their need for elastic bandwidth. Furthermore, the presentation will review best practice recommendations including 100G ready cloud infrastructure, GMPLS based intelligent control plane for automation and restoration, and how to best leverage WDM with integrated digital switching and bandwidth virtualization to enable elastic bandwidth.